died after a long battle with cancer. establish Glastonbury as the capital of the new-age movement. 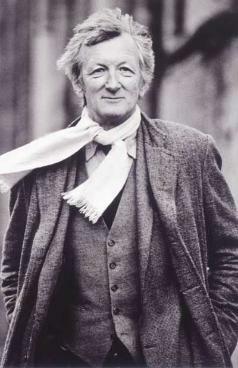 and many more died early this morning, 24 April 2009, aged 76.
contemporary paganism and modern antiquarianism. phenomenon, which he felt was ultimately mysterious, even divine in origin. a good friend of its founding editors. the city a few weeks ago to die peacefully in the countryside. A very big loss to us all. 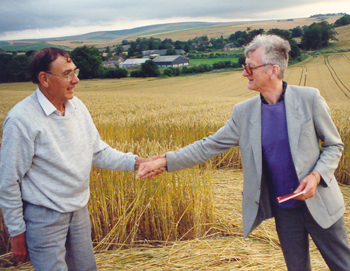 Pat Delgado greeting John Michell in a crop circle in Wiltshire. much like a philosopher in the Platonic tradition. read modern languages. He served in the Royal Navy and later joined the civil service as a Russian interpreter. His writing career began in 1967 with the publication of The flying saucer vision: the Holy Grail restored. monuments demonstrated traces of what he called "a gigantic work of prehistoric engineering". previously lost or ignored works of ancient wisdom. preserve traditional weights and measures led to his establishment, in 1970, of the Anti-Metrication Board. its bureaucratic adversary, the Metrication Board, by several years." provided a preface to the 1974 edition of Stirling's work The Canon, re-published by Rilko. Bacon and including the Earl of Oxford, may have been the authors. was held during 2003 at the Christopher Gibbs gallery in London.